Okay. I think I'm feeling better! ∞ Things I'm drinking... plain chamomile tea, chamomile with mint, orange spice tea, homemade lemon-ginger tea, homemade Russian tea (thanks MOM! ), not much coffee, a coke, cold water. Drown a cold, right? ∞ Save Snail Mail: A Warm PO Box second pic down! :) and congrats to the winner. On my way to clear out the mail box -- first time I'd been outside in days! 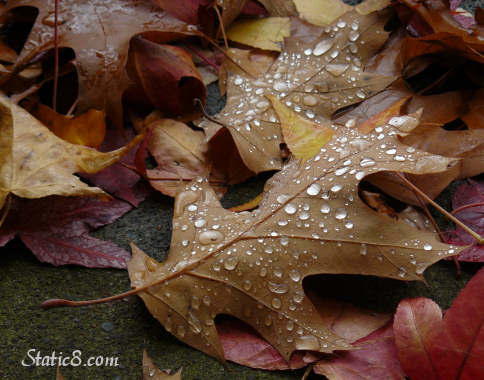 -- I took pictures of the leaves on the ground.